DECK FITTINGS Deck fittings are used aboard ships and boats mainly for the securing of mooring lines. All fittings shown in figure 7-7 are found aboard ship except the bollard, which is a pier fitting. The pad eye shown in the figure is not used for mooring but for towing other vessels. Different variations of the pad eye are used for securing heavy objects and equipment. DAVITS Boats carried aboard ships usually are handled by powerful cranes and booms. These cranes and booms hook onto slings attached to hoisting points built into the strong parts of the boats structure. Boats stowed at davits are lowered and hoisted by the davit machinery. Basically, a set of davits is nothing more than a special crane that is designed specifically for handling boats in a safe and timely manner. BOAT BOOMS Ships that are at anchor or moored to a buoy rig out their boat booms for the purpose of mooring their boats well clear of the side. This method of securing is known as hauling out to the boom. Forward booms are called lower booms; after booms are called quarter booms. 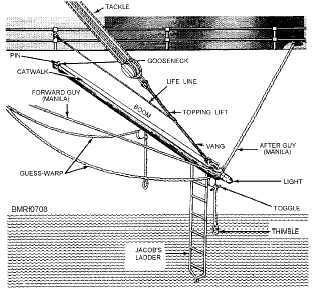 The boat boom shown in figure 7-8 is a spar that is secured to a gooseneck by a pin on the side of the ship. This arrangement allows free motion fore and aft. The outboard end of the boom hangs from a wire vang and tackle combination called the topping lift. Fore-and-aft motion is controlled by lines called forward and after guys. A strong line called a guess-warp runs from well forward on the ship out through a block or blocks on the boom and ends in a metal thimble through which boats can reeve (pass) their bowlines. A small piece of wood called a toggle is seized between strands of the guess-warp above the thimble to keep it from running up out of reach when a boat lets go. One or more Jacobs ladders (a rope ladder) from the boom permit boat crews to come aboard. REVIEW 1 QUESTIONS Q1. List six types of ground tackle used aboard ships. a. b. c. d. 7-6 Student Notes: Figure 7-7.Deck fittings. 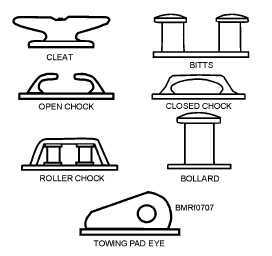 Figure 7-8.Parts of a boat boom.